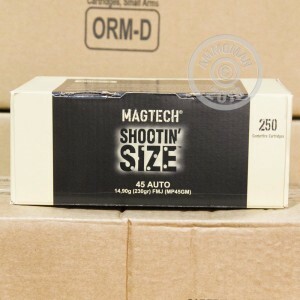 Magtech's "Shootin size" 250 round box in 45 ACP will keep your pistol running all day at the range. 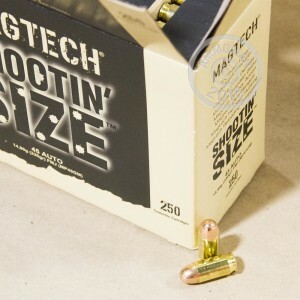 This ammo, packed in a box of 250 rounds, uses a standard 230 grain full metal jacket bullet for solid 45 Auto ballistics. The cartridges use Magtech's house-made non-corrosive Boxer primers, propellant, and brass, all produced at the same facility located outside Sao Paulo, Brazil. 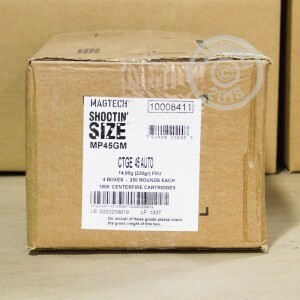 Magtech brand ammo is manufactured by CBC, a major supplier to the Brazilian military, using automated assembly lines. Buy this box or any other items totaling over $99 from AmmoMan.com to get free shipping on your order. That means you pay only the list price, with no fees added at checkout.